The Yankees re-signed Stephen Drew, for one year and a few million dollars. It’s a questionable deal — nothing was available much beyond what Drew signed for, for a reason — but it at least seems like a better deal than the Royals giving Kendrys Morales two years. And the idea is simple: Drew’s a known capable defender, and he’s hit before, and if he totally busts, he can be dumped with little problem. The Yankees paid for a little insurance, and as recently as 2013 Drew was an above-average player. There was never a time in which he looked like a major league hitter. Pretty harsh, pretty bleak. Pretty true, or pretty hyperbolic? That much, we can try to investigate. Did 2014 Stephen Drew ever actually look like a major-league hitter? The overall picture would suggest that, no, he didn’t. Last year, 311 players batted at least 250 times. Stephen Drew finished with a lower wRC+ than the 310 of them who were not himself. Drew was baseball’s very worst hitter in June. He was in the bottom 7% in August. He was in the bottom 4% in September. The excuse is that Drew missed spring training, so he had to have his own spring training during the regular season, but through June and July, Drew posted a .583 OPS. Through August and September, he posted a .491 OPS. Drew got worse, but I guess we’ve grown accustomed to spring-training hitting numbers being inflated. Drew’s situation is unusual because he had no spring training then sat out for nearly two months before signing. One hundred or so at-bats into the season, Drew finally looks like he’s coming out of it. Drew never really came out of it. He didn’t end up where he needed to be. But remember, the question isn’t whether Drew was a major-league hitter throughout 2014. The question is, did he ever look like one, at any point? There’s no way to treat this but subjectively. It wouldn’t be fair to isolate individual at-bats. Drew did finish with some hits, and some home runs. Isolate individual at-bats and you could make Randy Johnson or Bartolo Colon look like a major-league hitter (probably). No, I think we need some sort of minimum. Just as one at-bat isn’t enough, I don’t think one game is enough. I think we need a sequence of games. At least a small sequence of games. Did Stephen Drew ever look like a major-league hitter over multiple days? Drew started 78 times. That means he had 74 stretches of five starts. Over just seven of those did he manage a five-start-stretch batting average of .300 or better. His August was a complete and utter statistical hellscape. Somehow September was even worse. Drew’s longest season hitting streak was three games. He did that in June. Let’s look at that streak, in June. Between June 15 and June 17, Drew went 5-for-10. Before that, he was awful. After that, he was godawful. But, can we accept three games? Did Drew look like a major-league hitter over three games? Upon closer review, not really. He struck out three times. One of the hits was a blooper. Two of them were routine Green Monster fly balls, that were probably outs elsewhere. One hit was a slap single the other way. The remaining hit was on a meatball right over the middle. During the stretch, Drew got to face Kevin Correia. If we’re going to judge this by appearance — and I don’t think we have a choice — Drew didn’t look bad, but he didn’t look real good, either. He just swung and wound up with some hits. Even bad hitters do that. A bad hitter did do that. So if we don’t count that stretch, we’re left with…one remaining candidate stretch, in the middle of July. Over the stretch, Drew batted .381, and slugged .810. Very promising numbers. How were the visuals? Following, a selection of Stephen Drew fair batted balls. These go in chronological order. This wound up as a triple. In the same game, Drew also struck out and grounded out, and he was issued an intentional walk to set up a force. So the triple wasn’t surrounded by good at-bats. But, it’s a triple, hit with authority. Let’s accept this as a starting point. Screaming line-drive double play. Good luck and bad luck canceled out over something like 20 or 30 minutes. This is a big-league screaming line-drive double play. Ding dong! Following a trip to the plate in which he walked, and walked unintentionally, Drew went down and laced a single to center. Could this be? Could this be 2014 Stephen Drew as a major-league hitter? Now we’re to another game still. This was a mistake, a changeup high that was supposed to be a changeup low, but Drew covered it, smashing the ball just far enough away from Lorenzo Cain. The best big-league hitters are able to hit pitches thrown well, but we’re not trying to hold Drew to such an impossible standard. He just needs to pass the big-league smell test. More batted-ball authority. As things turned out, this was a somewhat catchable baseball, but Drew hit it hard, which is the point. And though it was thigh-high, it was around the plate’s outer edge. Full marks for this one. Hard liner! A home run! A bad pitch, but, a home run! Not an impressive home run, according to the ESPN Home Run Tracker, but the contact was good. Let’s not get too picky about our home runs. Stephen Drew has been on everything he’s swung at tonight. You know who’s on pitches they swing at? Major-league hitters. For good measure, another home run. A home run, granted, on a pitch that couldn’t possibly have been any more right down the middle, and it was a 7-1 game in the top of the ninth. But a dinger’s a dinger. This is how Drew closed out his hot stretch. The next day, he went 0-for-3, with two outs in the air and a whiff. The day after that, he went 0-for-2, with a groundout and a whiff. The following four games saw him go 2-for-15. Drew’s hot streak ended immediately. But it existed. It existed. 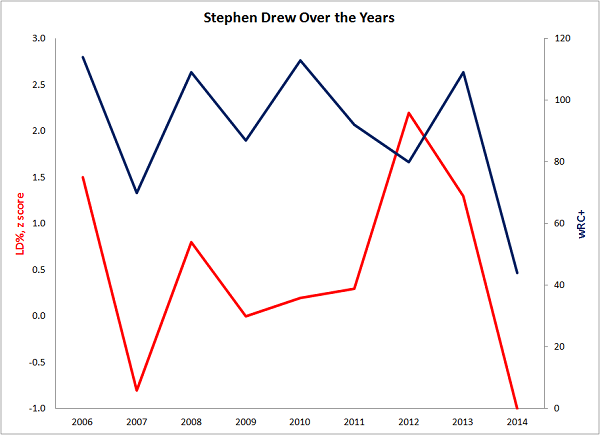 Did 2014 Stephen Drew ever look like a major-league hitter? The answer is YES, between July 11 and July 22, a stretch interrupted by the All-Star break, a couple games off, and an 0-for-3 against Kansas City. Drew resembled a major-league hitter in five of six starts over a two-week span, and though a lot of that came against pretty unimpressive pitching, sometimes real major-league hitters get to face unimpressive pitching, and they need to be able to hit it. Drew hit it. He didn’t hit it before, and he didn’t hit it after, but he hit it in the moment. The quoted executive must not have been paying attention. An MLB executive asserted that, last year, Stephen Drew never looked like a major-league hitter. After reviewing the data, we find that Drew did look like a major-league hitter, for a few days in the middle of July. He also homered in both games of a July 5 doubleheader. That day he went hitless in his other five at-bats, and the game before he was 0-for-3, and the game after he was 0-for-5, but, two homers. You have to give Stephen Drew some credit. Even though last season he missed all of spring training, when he got back to the big leagues he didn’t literally never look like a major-league hitter. He just almost literally never looked like one. We hoped you liked reading Did Stephen Drew Ever Look Like a Major-League Hitter? by Jeff Sullivan! Three Articles In A Row Ending In A Question Mark?